When investors think of energy in the Middle East, they probably think oil, but with new developments in the region, it may be time to think sun. Businesses and individuals interested in solar energy can look to the Middle East, North Africa (MENA) region as a growing area for the renewable energy source. Between 2008 and 2011, solar energy grew 112 percent in MENA countries, which include Saudi Arabia, Egypt, and Tunisia, while fossil fuels only grew by 6 percent, according to data released by the Renewable Energy Policy Network, a global nonprofit that researches sustainable energy. The sunny climate of the region makes it an ideal place to develop solar energy, and MENA countries want to use solar to meet their local energy needs, especially in rural areas, while exporting more of their traditional fossil fuel products. Interestingly for foreign companies, one of the most recent solar plants in the MENA region had the support of foreign investors. The Shams-I plant, a 100-megawatt plant in the United Arab Emirates, received 40 percent of its $600 million in investment from abroad. The French company Total and the Spanish company Abengoa Solar each invested 20 percent of the funds needed for the plant. Since 21 MENA countries have renewable energy targets for 2030, including goals for solar energy, the potential for foreign business partnerships may be substantial. Bahrain and Dubai have opened previously closed power industries to foreign investment. 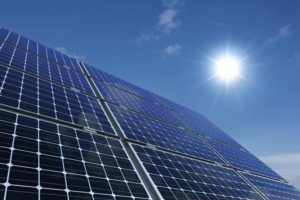 Upcoming solar projects include a 160-megawatt plant in Morrocco planned for completion late 2014 and a 303-kilowatt plant in Oman planned for June 2014. For information about how to invest in MENA solar projects, visit the website of the International Renewable Energy Agency, an intergovernmental organization that facilitates international collaboration for renewable energy. Elisabeth, thank you for such an informative and interesting post. The list of countries moving to clean, affordable solar energy is certainly increasing. MENA regions are making efforts to reduce their nations’ dependence on energy sources. This will not only help boost their economies and improve their environment, but also create thousands of jobs. This also means that Arabic linguists are in high demand!!! I’m glad you enjoyed the post, Nisar! Arabic is definitely already important in the energy industry, and should become more important as these countries expand into renewables.